Large A4 Sized Card....Definitely Has The WOW Factor! We pride ourselves on providing unique personalised designs that will stand out from the crowd. 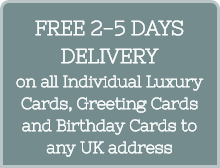 Although our cards may not be the cheapest online, once you receive a Gibson Doyle hand made product we are sure you will be impressed with the quality of materials, colour palette, attention to detail and professional finish that goes into our work. 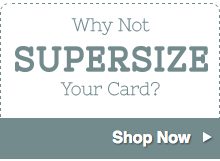 Our stationery is in a different league to high street greeting card retailers. Many of our eye catching embellishments are created in house and are truly hand made. 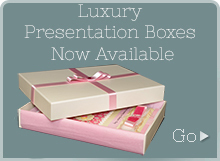 Luxury presentation boxes and a Supersize upgrade are also available for a fantastic finishing touch to our Greeting, Birthday, Valentine's day cards and Seasonal cards. All of our Wedding stationery designs and party invitations are individually hand made by a friendly experienced team working from their studio in Halifax, West Yorkshire. Personal service is paramount within our company and we will go the extra mile to communicate with customers, make sure their order has a quick turnaround and is carefully packaged. Our company really wants to please!